Our bunco group started up very recently, in January 2008. We had such a good time at a New Year’s Eve party that we decided we needed to get together more often and our Bunco group was born. We meet up once a month, usually on the 3rd Saturday of the month and everyone takes a turn hosting (although we’re pretty informal about the turn-taking). 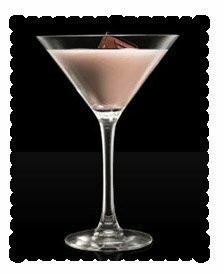 We have slowly morphed into having ‘themed’ nights – Cinco de Mayo (with killer blue margaritas), St. Patrick’s feast, wine and cheeses, grill nights (complete with s’mores in a fire pit), and chocolate for Valentine’s Day, just to name a few. Our newest bit of fun is a traveling pig. 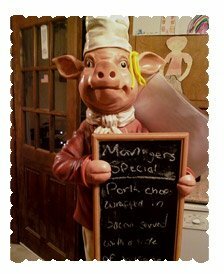 The pig arrived at the January host’s house with a poem telling about his life and why he has run away from his farm to our Bunco group. The end of the poem instructed the member to ‘provide new text’. So the pig has traveled, going to a new member’s house each month, complete with a new poem or story! We are saving the poems that get written and have put them in a plastic sleeve so they don’t go missing. The pig is DEFINITELY a highlight of our get-togethers! Cut each slice of bacon in half lengthwise. Take a single bacon strip and spiral it around a breadstick, covering breadstick from end to end. Roll bacon covered breadstick in parmesan cheese until coated. Place on baking sheet. Repeat until all breadsticks are wrapped and rolled. Place baking sheet in very low (250 degrees) oven and bake for about one hour. Serve hot. 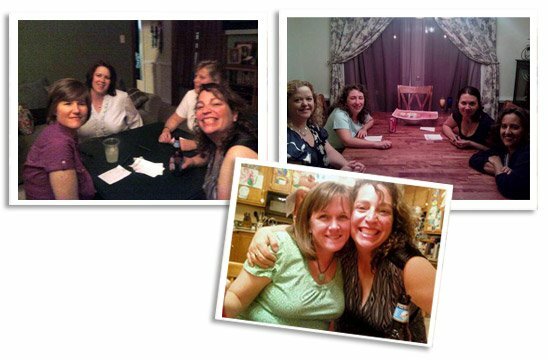 Want your Bunco group featured here? From time to time I’ll be highlighting a different group, complete with pictures, party tips and recipes.